Pensive Bytes « Extraordinary Knowledge & Intelligence is Required to Contemplate the Obvious. Extraordinary Knowledge & Intelligence is Required to Contemplate the Obvious. Converting the carbon dioxide and hydrogen into hydrocarbons that can then be used to develop JP-5 fuel stock. The technology has an economically viable widespread applicability. Scientists at the U.S. Naval Research Laboratory (NRL) are developing a process to extract carbon dioxide (CO2) and produce hydrogen gas (H2) from seawater. Then they catalytically convert the CO2 and H2 into jet fuel by a gas-to-liquids process. The NRL effort has successfully developed and demonstrated technologies for the recovery of the CO2 and the production of the H2 from seawater using an electrochemical acidification cell, and the conversion of the CO2 and H2 to hydrocarbons that can be used to produce jet fuel. Electrochemical Acidification Carbon Capture Skid. Click image for more info. NRL research chemist Dr. Heather Willauer said, “The potential payoff is the ability to produce JP-5 jet fuel stock at sea reducing the logistics tail on fuel delivery with no environmental burden and increasing the Navy’s energy security and independence.” JP-5 is very close chemically to kerosene and diesel. Technically, the NRL has developed a two-step laboratory process to convert the CO2 and H2 gathered from the seawater to liquid hydrocarbons. In the first step, an iron-based catalyst can achieve CO2 conversion levels up to 60% and decrease unwanted methane production from 97% to 25% in favor of longer-chain unsaturated hydrocarbons (olefins). Then in step two the olefins can be oligomerized (a chemical process that converts monomers, molecules of low molecular weight, to a compound of higher molecular weight by a finite degree of polymerization) into a liquid containing hydrocarbon molecules in the carbon C9-C16 range, suitable for conversion to jet fuel by a nickel-supported catalyst reaction. The raw materials are abundant. CO2 is an abundant carbon source in seawater, with the concentration in the ocean about 140 times greater than that in air. Two to three percent of the CO2 in seawater is dissolved CO2 gas in the form of carbonic acid, one percent is carbonate, and the remaining 96 to 97% is bound in bicarbonate. When processes are developed to take advantage of the higher weight per volume concentration of CO2 in seawater, coupled with more efficient catalysts for the heterogeneous catalysis of CO2 and H2, a viable sea-based synthetic fuel process could be developed. The NRL effort made significant advances developing carbon capture technologies in the laboratory. 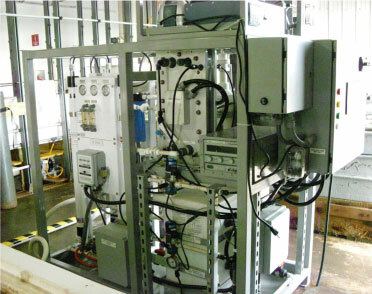 In the summer of 2009 a standard commercially available chlorine dioxide cell and an electro-deionization cell were modified to function as electrochemical acidification cells. Using the novel modified cells both dissolved and bound CO2 were recovered from seawater by re-equilibrating carbonate and bicarbonate to CO2 gas at a seawater pH below 6. In addition to CO2, the cells produced H2 at the cathode as a by-product. Note that the oceans offer a huge reserve of raw materials for fuel production. The completed studies of 2009 assessed the effects of the acidification cell configuration, seawater composition, flow rate, and current on seawater pH levels. The data were used to determine the feasibility of this approach for efficiently extracting large quantities of CO2 from seawater. From these feasibility studies NRL successfully scaled-up and integrated the carbon capture technology into an independent skid, or “lab on a pallet’ so to speak, called a “carbon capture skid” to process larger volumes of seawater and evaluate the overall system design and efficiencies. The carbon capture skid’s major component is a three-chambered electrochemical acidification cell. The cell uses small quantities of electricity to exchange hydrogen ions produced at the anode with sodium ions in the seawater stream. As a result, the seawater is acidified. At the cathode, water is reduced to H2 gas and sodium hydroxide (NaOH) is formed. This basic solution may be re-combined with the acidified seawater to return the seawater to its original pH with no additional chemicals. Current and continuing research using the carbon capture skid demonstrates the continuous efficient production of H2 and the recovery of up to 92% of the CO2 from seawater. The carbon capture skid has been tested using seawater from the Gulf of Mexico to simulate conditions that will be encountered in actual open ocean processing. The NRL group is working now on process optimization and scale-up. Initial studies predict that jet fuel from seawater would cost in the range of $3 to $6 per gallon to produce. Willauer points out, “With such a process, the Navy could avoid the uncertainties inherent in procuring fuel from foreign sources and/or maintaining long supply lines.” During the government’s fiscal year 2011, the U.S. Navy Military Sea Lift Command, the primary supplier of fuel and oil to the U.S. Navy fleet, delivered nearly 600 million gallons of fuel to Navy vessels underway, operating 15 fleet replenishment ships around the globe. The Navy’s fuel supply system works at sea, while underway and is a costly endeavor in terms of logistics, time, fiscal constraints and threats to national security and the sailors at sea. It’s a brilliantly insightful use of the environment. Moreover the technology will help clean the seawater of an overcharge of CO2 and that is actually a recycling of fossil fuel additions to the environment. Entrepreneurs are going to realize the Navy’s work could be an industrial boon to fuel production as well as shorten the carbon cycle. While the Navy thinks $3 to $6 for production cost, the private sector would very likely drive that cost far further down. It’s not hard to imagine that in a few years most of the oil business might simply be at sea, harvesting CO2 and H2, making petroleum products from a recycling of the CO2 from the past use of fossil fuels. Many may complain that the military is a waste, poor policy, or other notions that fly in the face of human nature. But in the past few decades the U.S. military, filled with volunteers, can make significant contributions, and now perhaps solve what has been thought to be an intractable problem. What Will It Take to Get a Woman in the White House? Marianne Schnall’s new book poses a simple question: Why does America lag behind so many other countries when it comes to electing a female leader? This book started with a question. When Barack Obama was first elected, my family and I were talking about how wonderful it was to have our first African American president. My then-eight-year-old daughter, Lotus, looked at me through starry eyes and deadpanned this seemingly simple, obvious question: “Why haven’t we ever had a woman president?” It was a really good question, one that, despite having spent two decades running the women’s nonprofit website Feminist.com and writing about women’s issues, I found difficult to answer. But it is these types of questions, often out of the mouths of babes, that can wake us up out of a trance. Many inequities have become such a seamless part of our history and culture that we may subliminally begin to accept them as “just how it is” and not question the “why” or explore the possibility that circumstances could be different. It does seem a bit crazy when you think of it: When so many other nations have women presidents, why doesn’t the United States? Margaret Thatcher was elected prime minister of Great Britain three times. Argentina, Iceland, the Philippines, Nicaragua, Ecuador, Finland, Ireland, Liberia, Chile, and South Korea have elected female heads of state. Yet the United States, presumably one of the most progressive countries in the world, lags dismally behind. We have finally elected an African American president; when will we celebrate that same milestone for women? Fast-forward a few years later to the 2011 primary season, when I was talking to an editor at CNN’s In America division about writing a piece for them. I was about to cover the Women’s Media Center awards, where I would be interviewing people like Gloria Steinem, Jane Fonda, Sheryl Sandberg, Arianna Huffington, and others, so I asked CNN if there were any questions in particular they wanted me to ask. They said they were interested in the attendees’ impressions of why women have gained such little momentum in Washington just four years after having a near presidential contender, and what we can do to get more women into the pipeline of political leadership. Taking that one step further, I decided to add a question related to my daughter’s query by asking, “What will it take to make a woman president?” That article wound up on the CNN home page and received hundreds of comments, both positive and negative. The popularity of the article made me realize how important and timely this topic really was, and that it was worth exploring even further. So here it is: my journey to get answers to some of these questions through speaking to some of the most influential journalists, activists, politicians, and thought leaders of today. Why haven’t we had a woman president? What will it take? And why is it important? While I use a woman president as a symbol, this book is also about the broader goal of encouraging women and girls as leaders and change agents in their lives, their communities, and the larger world. It also explores the many changing paradigms occurring in politics and in our culture, which the recent election seems to confirm. I hope to spotlight these positive shifts, as well as identify where the remaining obstacles and challenges are, in hopes that by looking at these themes from so many sides and perspectives, we can move closer to meaningful and effective solutions. Certainly, we need to imagine not only a world where a woman can be president, but one in which women are equally represented in Congress and many other positions of leadership and influence in our society. While it was history-making to have elected 20 women to the Senate in 2012, 20 percent is still far from parity. Women are 50 percent of the population, yet they occupy just a fraction of that in elected office. The United States currently ranks seventy-seventh on an international list of women’s participation in national government. And the numbers are not much better in the corporate world: a meager 21 of the Fortune 500 CEOs are women, and women hold about 14 percent of executive-officer positions and 16 percent of board seats. Women are in only about five percent of executive positions in the media. Across the board, women are rarely adequately represented at the tables where important decisions are being made. Yet everywhere I look today, very promising campaigns and projects are emerging to help women attain positions of influence and leadership. A few years ago, I wrote an article about then–Secretary of State Hillary Clinton’s Women in Public Service Project, whose ambitious goal is global, political, and civic leadership of at least 50 percent women by 2050. I also interviewed Senator Kirsten Gillibrand about her Off the Sidelines Project, which is “a nationwide call to action to get more women engaged . . . to enter political life and be heard on political issues.” And Facebook COO Sheryl Sandberg’s book, Lean In, has certainly helped to spark a nationwide conversation and movement and an important debate over the factors impacting women’s leadership and advancement in the workplace. These are issues that I think benefit from a hashing-out of multiple perspectives: men’s, women’s, Republicans’, Democrats’, racial, and generational. I tried as best I could within the limited time, capacity, and access I had to include and reach out for that diversity, but, of course, I do recognize that this is but a small sampling of outlooks. My hope is that this book will be enlightening, educational, thought-provoking, and entertaining, as well as a call to action. While it does not necessarily offer any easy, quick, or complete solutions to the complex, multifaceted questions of how we can help women move into more positions of influence and leadership, my hope is that it will help to identify some of the obstacles so that we can at least be aware of them—and be woken up, as my daughter’s question did for me, to being proactive, rather than simply accepting the current state of affairs as “just how it is.” It will take long, engaged, thoughtful conversation and effort, from both men and women, to move our systems and culture along. I thank all of the remarkable people in this book for being a part of this literary roundtable and for the meaningful work they do on the many prongs of these issues. And, since I would still like to include so many viewpoints and ongoing resources, a portion of the proceeds of this book will go toward continuing the conversation and community around women’s leadership at the 18-year-old women’s website and nonprofit I run, Feminist.com. I hope you will join me in supporting this movement, and I hope by the time my daughter has her own children (if that is her choice! ), we will live in a world where having a woman president seems not like an unachievable and daunting milestone, but instead like one that girls everywhere can aspire to and reach, if that is their destiny and calling. Excerpt from What Will It Take to Make a Woman President? Conversations About Women, Leadership and Power, by Marianne Schnall. With permission from Seal Press, a member of the Perseus Books Group. Copyright 2013. Courtesy of Tony Baer’s OnStrategies blog. Fast Data, used in large enterprises for highly specialized needs, has become more affordable and available to the mainstream. Just when corporations absolutely need it. Of the 3 “V’s” of Big Data – volume, variety, velocity (we’d add “Value as the 4th V) – velocity has been the unsung ‘V.’ With the spotlight on Hadoop, the popular image of Big Data is large petabyte data stores of unstructured data (which are the first two V’s). While Big Data has been thought of as large stores of data at rest, it can also be about data in motion. “Fast Data” refers to processes that require lower latencies than would otherwise be possible with optimized disk-based storage. Fast Data is not a single technology, but a spectrum of approaches that process data that might or might not be stored. It could encompass event processing, in-memory databases, or hybrid data stores that optimize cache with disk. Wall Street firms routinely analyze live market feeds, and in many cases, run sophisticated complex event processing (CEP) programs on event streams (often in real time) to make operational decisions. Telcos have handled such data in optimizing network operations while leading logistics firms have used CEP to optimize their transport networks. In-memory databases, used as a faster alternative to disk, have similarly been around for well over a, having been employed for program stock trading, telecommunications equipment, airline schedulers, and large destination online retail (e.g., Amazon). Hybrid in-memory and disk have also become commonplace, especially amongst data warehousing systems (e.g., “>Teradata, Kognitio), and more recently among the emergent class of advanced SQL analytic platforms (e.g., Greenplum, Teradata Aster, IBM Netezza, HP Vertica, ParAccel) that employ smart caching in conjunction with a number of other bells and whistles to juice SQL performance and scaling (e.g., flatter indexes, extensive use of various data compression schemes, columnar table structures, etc.). Many of these systems are in turn packaged as appliances that come with specially tuned, high-performance e backplanes and direct attached disk. The usual factors: the same data explosion that created the urgency for Big Data is also generating demand for making the data instantly actionable. Bandwidth, commodity hardware, and of course, declining memory prices, are further forcing the issue: Fast Data is no longer limited to specialized, premium use cases for enterprises with infinite budgets. Not surprisingly, pure in-memory databases are now going mainstream: Oracle and SAP are choosing in-memory as one of the next places where they are establishing competitive stakes: SAP HANA vs. Oracle Exalytics. Both Oracle and SAP for now are targeting analytic processing, including OLAP(raise the size limits on OLAP cubes) and more complex, multi-stage analytic problems that traditionally would have required batch runs (such as multivariate pricing) or would not have been run at all (too complex, too much delay). More to the point, SAP is counting on HANA as a major pillar of its stretch goal to become the #2 database player by 2015, which means expanding HANA’s target to include next generation enterprise transactional applications with embedded analytics. For such organizations, Fast Data is no longer a luxury, but a necessity. More specialized use cases are similarly emerging now that the core in-memory technology is becoming more affordable. YarcData, a startup from venerable HPC player Cray Computer, is targeting graph data, which represents data with many-to-many relationships. Graph computing is extremely process-intensive, and as such, has traditionally been run in batch when involving Internet-size sets of data. YarcData adopts a classic hybrid approach that pipelines computations in memory, but persisting data to disk. YarcData is the tip of the iceberg – we expect to see more specialized applications that utilize hybrid caching that combine speed with scale. The movement – or tiering – of data to faster or slower media is also nothing new. What is new is that data in memory may not longer be such a transient thing, and if memory is relied upon for in situ processing of data in motion or rapid processing of data at rest, memory cannot simply be treated as the new disk. Excluding specialized forms of memory such as ROM, by nature anything that’s solid state is volatile: there goes your power… and there goes your data. Not surprisingly, in-memory systems such as HANA still replicate to disk to reduce volatility. For conventional disk data stores that increasingly leverage memory, Storage Switzerland’s George Crump makes the case that caching practices must become smarter to avoid misses (where data gets mistakenly swapped out). There are also balance of system considerations: memory may be fast, but is its processing speed well matched with processor? Maybe solid state overcomes I/O issues associated with disk, but may still be vulnerable to coupling issues if processors get bottlenecked or MapReduce jobs are not optimized. Declining memory process are putting Fast Data on the fast lane to mainstream. But as the technology is now becoming affordable, we’re still early in the learning curve for how to design for it. Researchers from Russia, US, China and several other countries on Wednesday released details of the asteroid that exploded violently above the Russian city of Chelyabinsk in February this year, calling it “truly a wake-up call” for the world. “There are only less than one percent of Chelyabinsk-sized objects out there being documented, meaning more than 99 percent of similar objects which can give a populated region a bad day remain undetected,” Qing-Zhu Yin, professor of the University of California, Davis, who participated in analyzing the event, told Xinhua. “If the humanity does not want to become dinosaurs, we need to study this kind of object in details,” Yin said. Chelyabinsk was one of the largest meteoroid strikes since the Tunguska event of 1908, and thanks to modern consumer electronics, field sensors and advanced laboratory techniques available nowadays, provides an unprecedented opportunity to study such an event, the researchers reported. The study, published in the journal Science, was led by Olga Popova of the Russian Academy of Sciences in Moscow, and by US astronomer Peter Jenniskens, join by researchers from China and eight other countries. The researchers visited 50 villages around Chelyabinsk in the weeks that followed the violent airburst and collected data on the asteroid that caused it as well as the damage it caused. They also used security cameras and dash-cams in peoples’ cars to re-trace the fireball’s path through the sky. Based on their study, they determined that the asteroid was originally 19.8 meters wide, although it left a hole just 7 meters wide in the ice where it landed and that the weight before entering the atmosphere was 13,000 tons. After entering atmosphere, it exploded several times as it was descending, starting at 83 km, 54 km, 29.7 km, and finally at 27 km, and reached its brightest and hottest point at an altitude of about 30 km, when it was traveling at about 18.6 km per second, or 50 times faster than a bullet, the researchers said. The researchers also estimated that the total energy of the event, which shattered thousands of windows in Chelyabinsk, was the equivalent to an explosion of around 600,000 tons of TNT. “Much of the materials were evaporated in the atmosphere thankfully, and causing less damage on the ground. And the final mass landed on were estimated to be 4000-6000 kg only, with the largest single stone at about 650 kg excavated the Chebarkul lake bed,” Yin said. “The ground damage area due to the blast wave is estimated to be 6000 km2. The shape of the damaged area on the ground looks like a butterfly,” he said. The Chelyabinsk meteorite belongs to the most common type of meteorite, an “ordinary chondrite”. If a catastrophic meteorite strike were to occur in the future, it would most likely be an object of this type, Yin said. Chemical and isotopic analysis confirmed that the object was 4, 452 million years old, and that it last went through a significant shock event about 115 million years after the formation of the solar system 4,567 million years ago. That impact was at a much later date than in other known chondrites of the same type, Yin said, suggesting a violent history. Meanwhile, two papers in the British journal Nature on Wednesday said the orbit of the Chelyabinsk asteroid seems to be similar to another asteroid that has orbited close to Earth, the 2- km-sized asteroid 1999 NC43, suggesting that the two were probably once part of the same object. The papers also predicted that the estimated damage for the tens of meter-sized objects like Chelyabinsk were actually ten times greater than previously thought. Yin noted that major meteorite strikes like Tunguska or Chelyabinsk occur more frequently than we tend to think. For example, four tons of material were recovered from a meteor shower in his hometown, Jilin, China in 1976. US researchers said Wednesday that monkeys in a lab have learned to control the movement of both arms on an avatar using just their brain activity. The findings, published in the US journal Science Translational Medicine, advanced efforts to develop bilateral movement in brain-controlled prosthetic devices for severely paralyzed patients, said researchers at Duke University, based in Durham, the state of North Carolina. To enable the monkeys to control two virtual arms, the researchers recorded nearly 500 neurons from multiple areas in both cerebral hemispheres of the animals’ brains, the largest number of neurons recorded and reported to date. Millions of people worldwide suffer from sensory and motor deficits caused by spinal cord injuries. Researchers are working to develop tools to help restore their mobility and sense of touch by connecting their brains with assistive devices. The brain-machine interface approach holds promise for reaching this goal. However, until now brain-machine interfaces could only control a single prosthetic limb. Nicolelis and his colleagues studied large-scale cortical recordings to see if they could provide sufficient signals to brain-machine interfaces to accurately control bimanual movements. The monkeys were trained in a virtual environment within which they viewed realistic avatar arms on a screen and were encouraged to place their virtual hands on specific targets in a bimanual motor task. The monkeys first learned to control the avatar arms using a pair of joysticks, but were able to learn to use just their brain activity to move both avatar arms without moving their own arms. As the animals’ performance in controlling both virtual arms improved over time, the researchers observed widespread plasticity in cortical areas of their brains. These results suggested that the monkeys’ brains may incorporate the avatar arms into their internal image of their bodies, a finding recently reported by the same researchers in the journal Proceedings of the National Academy of Sciences. The researchers also found that cortical regions showed specific patterns of neuronal electrical activity during bimanual movements that differed from the neuronal activity produced for moving each arm separately. The study suggested that very large neuronal ensembles — not single neurons — define the underlying physiological unit of normal motor functions, the researchers said, adding that small neuronal samples of the cortex may be insufficient to control complex motor behaviors using a brain-machine interface. Chinese doctors have discovered and registered a new mutant gene for alpha-thalassemia, first of its kind worldwide, an advance that enriches the gene database to assist researches into cures for genetic disease. Li Youqiong and colleagues from the People’s Hospital of Guangxi Zhuang Autonomous Region, discovered this gene, a 21.9, after a series of experiments on a carrier of the hereditary disease in 2011. Thalassemia is a disease where the carrier is missing or has malfunctioning genes responsible for making hemoglobin, the blood protein that helps to carry oxygen around the body. The hemoglobin molecule has subunits commonly referred to as alpha and beta. The mutant gene was identified by the end of 2012 before it was added to the GenBank database in the US-based National Center for Biotechnology Information(NCBI) and then disclosed to public on Oct.1 2013, according to Li. There is no effective cure for alpha-thalassemia, and the discovery of the new mutation will help prevention and research into the disease while preparing theoretical basis for future gene therapy. There are three main genetic sequence databases worldwide, which comprises the DNA Data bank of Japan(DDBJ),the European Molecular Biology Laboratory(EMBL) and GenBank at NCBI. These three organizations exchange data on a daily basis. An additional 7,000 companies globally are expected to become large enterprises with revenues of more than $1 billion by 2025, with 70 percent of them likely to be based in emerging regions, especially China, a report has said. The new report on the shifting global business landscape, which was released by the McKinsey Global Institute on Wednesday in Shanghai, said that many more large companies will develop in emerging cities and countries from the current 8,000 large companies worldwide, 75 percent of which are based in developed regions. China is without a doubt the most powerful growth engine for new global companies, and now is the time for forward-thinking cities to build their reputations among Chinese business leaders, the report said. The survey found that one-third of large companies are now headquartered in only 20 cities globally while three in 10 large Chinese companies are based either in Beijing or Shanghai. However, there might be more than 300 cities in China hosting at least one large company by 2025. “Many city officials are focused on luring corporate headquarters, but it is actually relatively rare for companies to move their head offices,” said Elsie Chang, an MGI senior research fellow. Chang added that the more promising opportunity lies in attracting foreign subsidiaries as thousands of global companies are expanding into new markets. For instance, opening more plants in China to make products tailored specifically to local buyers is the stated goal of PPG Industries Inc, a major global coatings and specialty products company, in the next three to five years. “China is a very important market for PPG, being the second-largest market among 70 countries, while we have plans to continue to invest in China as our business grows and we want to apply our best technology to help our customers,” said Mike Horton, PPG’s president for the Asia-Pacific region. With more than 30 plants in the Asia-Pacific region, 14 of which are on the Chinese mainland, PPG plans to develop its Chinese market step by step to become a major manufacturer and seller in the country. “We are planning to find and work with more high-standard factories to manufacture what we sell in China instead of importing products from overseas to meet the increasing demand within the country,” said Horton. The number of large companies based in emerging regions is poised to far more than triple by 2025, rising from around 2,200 today to about 7,000 in 2025. This reflects rising incomes and growing local market opportunities in these regions, as well as the fact that local companies are expanding, maturing, and reconfiguring through mergers or acquisitions, the MGI report said. About 280 up-and-coming cities in emerging economies could host the headquarters of a large company for the first time, becoming new hubs in global industry networks, it added. “The world’s competitive landscape will be transformed over the next 10 to 15 years by the rise of a formidable new breed of large emerging-market companies,” said Jonathan Woetzel, a director at MGI and one of the report’s authors. Woetzel added that the long-established dominance of Western multinationals is about to be challenged. In addition, China will also see more small and medium-sized companies becoming large ones as the number of large companies in China is expected to increase from 800 to more than 3,400 by 2025, the report said. Some private business owners in China are already pursuing the goal of transforming the scale of their companies from small and medium-sized to large. For example, the effects of the growing e-commerce industry are bringing impressive results to some sectors. Zhejiang Duoying Jewelry Co Ltd, which closed its physical shop and registered an online shop in 2012, saw its gross profit grow to 30 million yuan ($4.88 million) in 2012, twice the amount posted in 2011. “The peak period of export trading ended in 2011 with a sharp decrease of over 30 percent on annual output from 2008 while the amount of orders also declined nearly 40 percent,” said Zeng Hongqi, the general manager of Zhejiang Duoying Jewelry. Zeng added that he aims to boost his company’s profits with gradual annual growth and upgraded branding, going from the current mid-market clients to high-end customers in 10 years. In particular, more focus will be placed on the services sector in China, as Shenzhen and Nanjing are developing as hubs for non-State controlled, medium-sized companies with a higher share of global revenue from services companies than other leading emerging-region cities such as Mumbai, India, and Sao Paulo, Brazil, said the report. BEIJING – The upcoming policy meeting of the Communist Party of China (CPC) is expected to unveil a package of measures to deepen reforms to achieve sustainable economic development, said experts. The reforms are “essential for China as it tries to find a sustainable growth model over the medium and long term,” said the Wall Street Journal in an article. The Third Plenary Session of the 18th CPC Central Committee, which is expected to steer the country to an historic turning point, will kick off at this weekend. Thanks to three-decade reform and opening up, China has become the second largest economy in the world with an annual growth rate of nearly 10 percent and an approximate $6,000 GDP per capita. However, China’s economic growth has experienced a sequential slowdown since 2011, with a growth target of 7.5 percent in 2013. China is facing comprehensive problems such as production overcapacity, local debts and shadow banks. Population aging and an enlarging wealth gap also piles pressure on the old growth model. China’s economic development has entered a stage where only reforms can unleash growth potential and reduce risks, said a research report from Britain’s Barclays Bank. Experts anticipate that the new reforms will focus on urbanization — a critical driving force for China’s long-term economic growth. The director of the Asia Research Center of the London School of Economics, Athar Hussain, said China has made great changes in the past few years, noting that urbanization, which requires both economic and political reform, will become the most important issue for the Chinese government in the next five years. Hussain also forecasted that more city clusters, such as the Chengdu-Chongqing cluster in the central and western areas, will be created to reduce the stress on the four megacities of Beijing, Shanghai, Guangzhou and Shenzhen. Expert said a scientific and effective transformation to urbanization will stimulate domestic demand, balance investment and consumption, and inject new impetus to the economic growth. As a driving force of economic growth and rebalance, the Wall Street Journal said urbanization will be supported at the Third Plenary Session of the 18th CPC Central Committee on November 9-12. Experts also pointed out that the policy of focusing on the dominant role of people is very important, which will increase the autonomy and sustainability of China’s urbanization progress. History shows that land and agriculture is deeply related to the fate of Chinese people. The old urban-rural dual structure is expected to be reshaped following reforms in such fields as the land system, the social security system, modern agriculture and law. The Third Plenary Session of the 18th CPC Central Committee is an opportunity for China’s new leadership to show their wisdom by coping with those challenges, said Anoop Singh, director of the Asia and Pacific Department of the International Monetary Fund (IMF) in an article published on IMF’s website. The worst period for the Chinese economy seems to have passed – at least for China’s ultra-rich. The latest Hurun Rich List, released on Sept 11, showed that the average wealth of the entrepreneurs listed had risen by 18.5 percent over last year. But rather than indicating a recovering economy, this could just be an illustration of the “Matthew Effect” where the rich get richer and the poor get poorer. 59-year-old Wang Jianlin (王健林), chairman of the real estate giant Wanda Group, became China’s richest man for the first time with his 135 billion yuan. This broke the previous 130 billion yuan record for the wealthiest Chinese. Compared to last year, Wang’s wealth increased by 108 percent. Founder and Chairman of Hangzhou Wahaha Group Zong Qinghou (宗庆后), who held the top spot last year, fell to number two this year but still saw his wealth grow by 44 percent. Founder of Tencent Ma Huateng (马化腾) came in at third after his fortune grew 51 percent. The wealth accumulation rate of all these entrepreneurs far outpaced the growth of the Chinese economy, which only grew by 7 to 8 percent. Wang Zhongmin (王忠明), vice secretary-general of the All-China Federation of Industry & Commerce, says that even though China’s economic growth is slowing, wealth accumulation of the rich is speeding up. He says this indicates that private enterprises of a fairly large scale have started to enjoy a certain economic inertia. According to Hurun, the shift in this year’s rich list is a sort of microcosm of the industrial structure adjustment in China. “The wealth of the Rich List this year reached a new record mainly through the real estate industry recovery and the rapid development of IT,” Hurun said. Hurun also gave a nod to the progress of China’s urbanization, which was hoped to become the biggest engine driving China’s economy during “Twelfth Five-Year Plan” period (2011–2015). “No one is more representative than Wang Jianlin to represent China’s urbanization progress,” it said. Wang’s Wanda Group has branched into four industries including commercial real estate, high-end hotels, cultural tourism and department store chains. It’s opened 72 Wanda Plazas, 40 five-star hotels, 6,000 cinema screens, 62 department stores and 68 karaoke clubs across China. Wanda Group had total revenue of 141.7 billion yuan in 2012 with a profit of over 20 billion yuan. According to Hurun’s estimate, 80 percent of Wang Jianlin’s wealth comes from real estate. But the IT industry had the biggest gains this year. Three out of the top 10 richest Chinese on the list are in IT, and the total number of entrepreneurs on the list involved in the IT industry increased over 20 percent since last year. One of the best representatives on the list was Xiaomi Founder and CEO Lei Jun (雷军), who came in at 63rd. His wealth grew 567 percent from 2.4 billion yuan last year to 16 billion yuan this year. Xiaomi’s MI mobile phone is one of the most popular domestic made models in China, reaching 12.6 billion yuan in sales in 2012. However, the Rich List showed that not all of China’s super rich had such a good year. 252 entrepreneurs saw their wealth shrink, of which 77 percent came from publicly-listed companies. Six people experienced more than a 50 percent drop in their wealth and 115 entrepreneurs who made the list last year fell off altogether this time. It was the clothing and liquor industries that saw the biggest loss of wealth. Iron and steel, minerals and non-ferrous metals also saw big declines. Many entrepreneurs from these industries fell off the Rich List this year. The Hurun Rich List is being regarded as a mirror of China’s private economy. Wang Zhongmin says he hopes to see more private bankers on the list in the future. Gradual financial reform may allow this to happen. Meanwhile, Hurun says that the entertainment industry will be the most likely “dark horse” to make a splash in the future. As a Shaolin Temple disciple since childhood, Shi Xingfeng, president of Bojing Security Agency, often has to remind himself to hide the heroic spirit that often glows from the eyes of martial arts masters. As a matter of fact, the Chinese super-rich are still not accustomed to the idea of having tall, strongly built men in suits and a solemn face hanging around. It’s considered too indiscreet. “In China, bodyguards are disguised as chauffeurs or secretaries to protect the clients’ safety better,” Shi explains. But he also says there are cultural differences in the approach to paid protection. In the West, if a VIP’s hat has been blown off by the wind, his bodyguards are not to pick it up for him. A Chinese magnate though expects such services. “The Chinese super-rich have yet to nurture such a concept — a bodyguard is there to protect his safety, not to be his babysitter,” Shi laments. It was not until 2010 that privately run security services were even legalized in China, which is when Shi founded his security agency. He aspires to imitate Academi, formerly known as Blackwater USA, a security contractor that has worked for the U.S. State Department and usually retrains retired military or police personnel to become premium armed security guards. Moreover, since their homes and the venues they frequent are thought to be well-secured, VIPs in China don’t feel they are at particular risk. “The truth is that as public figures, rich people often attract hatred of the rich,” and are “in much greater danger than an ordinary person” of calculated attacks, Shi says. The latest example is Zong Qinghou, China’s beverage tycoon and the 86th richest man in the world, according to Forbes’ Global Rich List. He was attacked walking out of his own house and injured by someone who had asked him for a job. In most cases, whether they are robberies or retaliation, the perpetrators aren’t even “professional.” Had these entrepreneurs had a bit more awareness of safety issues, the tragedies wouldn’t have occurred. As the number of China’s super-rich grows, so do concerns for personal safety. “The demand is related to economic development, especially in the coastal cities such as Beijing and Shanghai,” says Xin Yang, the general manager of Beijing Yunhai Elite Security. Industry statistics show that China currently has some 4,000 licensed security firms with as many as 4.3 million security agents and an annual turnover of about 40 billion RMB ($653 million). And there is sure to be plenty of room for growth in the sector. For the rich and famous, it isn’t just their own personal safety, but that of their families and properties. This is a whole “engineering system,” as Shi puts it. Shi says the typical procedure when taking on a client is first to assess all the potential risks, then identify the level of danger and finally develop a specific strategy for protection. Teams of five to eight security personnel are typically dispatched. They include those specialized in anti-kidnapping, anti-tracking or target control, as well as those disguised as chauffeurs or secretaries to offer close minute-by-minute protection of the client. Having studied martial arts since the age of 15, and having later worked for years as one of the “Zhongnanhai Guards Group” protecting China’s top leaders, as well as foreign visitors such as Bill Gates, Zhe Meijie is considered one of the top Chinese security specialists. Before being put into service, candidates must go through a sort of boot camp, including physical training, kickboxing, martial arts and anti-kidnapping training, as well as business protocol. Half the training is related to skills and theories such as driving special vehicles, information collection, legal knowledge, public relations, emergency care and social etiquette. Physical techniques represent 20 percent and fighting 30 percent, Shi estimates.